Sport Injuries occur when participating in sports or physical activities associated with a specific sport, most often as a result of an accident. Sprains and strains, knee injuries, Achilles tendonitis and fractures are several examples of frequent injuries. According to Dr. Alex Jimenez, excessive training or improper gear, among other factors, are common causes. Through a collection of articles, Dr. Jimenez summarizes various causes and effects of sport injuries on the athlete. The most common treatment used for injuries is Rest, Ice, Compression and Elevation (RICE). Avoid activities that may lead to injury. Ice packs may be put on the injured area, which can decrease swelling and soreness. Ice ought to be implemented for many days, above a towel around the area for 15-20 minutes, four times every day. Never put ice directly on affected area. Compression of the wounded region also will help reduce swelling. Elastic wraps, splints and air casts all work well. Elevate the injured area above the heart level to reduce pain and swelling. Avoid playing when injured or tired. Most athletes have experienced a sprained ankle, which typically occurs when the foot turns inward. This turning stretches or tears the ligaments on the outside of the ankle, which are relatively weak. With an ankle sprain, it’s important to exercise to prevent loss of flexibility and strength and re-injury. Ask a doctor or physical therapist to help with what kinds of exercise to do. See A Doctor When: Note where the sprain has occurred. High ankle sprains are slower to heal and should be seen by a doctor to make sure the bones in the lower leg did not separate. One way to recognize a high ankle sprain is that it usually causes tenderness above the ankle. An athlete diagnosed with a concussion should never return to sport without being medically cleared by a health care professional trained in concussion evaluation. Common concussion treatments include rest, reduced activity which requires mental or physical stress and slowly increasing physical activities. This is fine, as long as, symptoms don’t return. Pushing off in a side-to-side motion causes strain of the inner thigh muscles, or groin. Common sports with groin injuries. Compression, ice, and rest will heal most groin injuries. However, returning to full activity too soon can aggravate the groin pull or turn it into a long-term problem. See Doctor When: A groin pull that has significant swelling should be seen by a doctor. Three muscles in the back of the thigh form the hamstring. The hamstring can over-stretch by movements i.e. hurdling, kicking the leg out sharply while running. Hamstring injuries are slow to heal because of the constant stress applied to the injured tissue from walking. To completely heal can take six to twelve months. Hamstring re-injuries are common because it’s hard for many to stay inactive that long. Fractures of the femur bone, labral tear and hip dislocation are common sport injuries that affect the hip. The hip joint is more vulnerable for injury when playing sports. Hip injuries require immediate intervention to avoid complications. Therapy and Rehabilitation programs are recommended following intervention, in which exercises enhance motions to strengthen the muscles. The hip flexors are muscles found on the upper-front side of the thigh. The main functions of the hip flexors are to lift the knee toward the trunk and to assist moving the leg toward and away from the other leg. The hip flexors can be weak in individuals who sit for long periods at work or can become weak and stiff in individuals who have poor sitting posture. These types of sport injuries can be caused from sprinting, running inclines and sports with sudden starts and quick turns. Common symptoms of a hip flexor strain include, pain when raising the leg, i.e. stair climbing and getting in and out of a car and running activities. When experiencing hip flexor strain there could be bruising in the front of the upper thigh and groin area. Hip flexor strain is best treated by rest and icing for 15 to 20 minutes for the first 48 to 72 hours. After the first three recovery days, the injured athlete can then apply heat for 15 to 20 minutes followed by lying down and performing gentle heel slides and hip flexor stretches. See A Doctor When: The pain, symptoms and limited activity are still there after two weeks. The anterior cruciate ligament (ACL) holds the leg bone to the knee. Sudden stops, weaving sharply in and out beating defenders and getting hit from the side can cause a strain or tear the ACL. A complete tear often makes a dreaded pop sound. See A Doctor When: If you suspect an ACL injury. ACL tears are potentially the most severe of the common sport injuries. A completely torn ACL usually requires surgery in athletes that wish to remain physically active. Patellofemoral syndrome results from repetitive movement of the kneecap (patella) against the thigh bone (femur), which can damage the tissue under the kneecap. Common sports with Patellofemoral injuries. One knee or both can be affected. Patellofemoral pain can take up to six weeks to heal. But It is important to continue low-impact exercise at this time. Working out the quadriceps also helps to relieve pain. Pains down the front of the lower legs are commonly called “shin splints.” Most commonly brought on by running, especially when starting a more strenuous training program like long runs on paved roads. The pain of shin splints is rarely an actual stress fracture, (a small break in shin bone). But one should see a doctor if the pain persists, even with rest. Stress fractures require prolonged rest, usually a month or more to heal. Rest, ice, and over the counter pain medicine are the common form of treatment. Intense pain in the shoulders when playing baseball, tennis and gymnastics, could result from a torn ligament or dislocation of the shoulder. These can be caused from overuse or what is known as Repetitive Motion Injury (RMI). 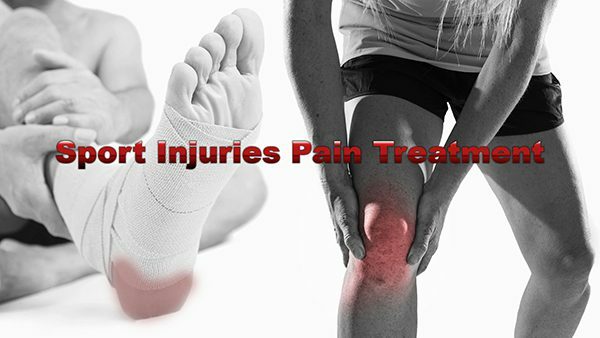 Simple pain or acute injuries can be treated with conservative therapy more serious or chronic injuries could require surgery. The weakest joint of the body is the shoulder and is takes a great deal of force during sports activities. Shoulder injuries can be caused by lack of flexibility, strength or stabilization. Shoulder injury treatment starts with rest and icing to help with pain and swelling. Pain persisting for more than two weeks should be evaluated by a physical therapist or doctor. Repetitive use of the elbow i.e. golf or tennis swings can irritate or make tiny tears in the elbow’s tendons. Epicondylitis is most common in 30-60 year-olds and is usually on the outside of the elbow. Epicondylitis usually clears up from staying off the tennis court or golf course until the pain improves.